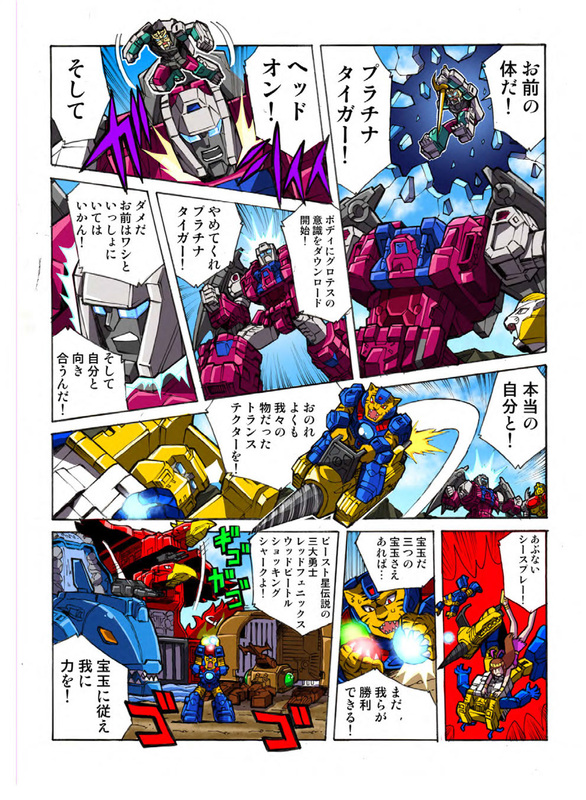 Takara Tomy Mall Website have uploaded a pdf file with their Takara Tomy LG-EX Repug & Grotes Web Comic. 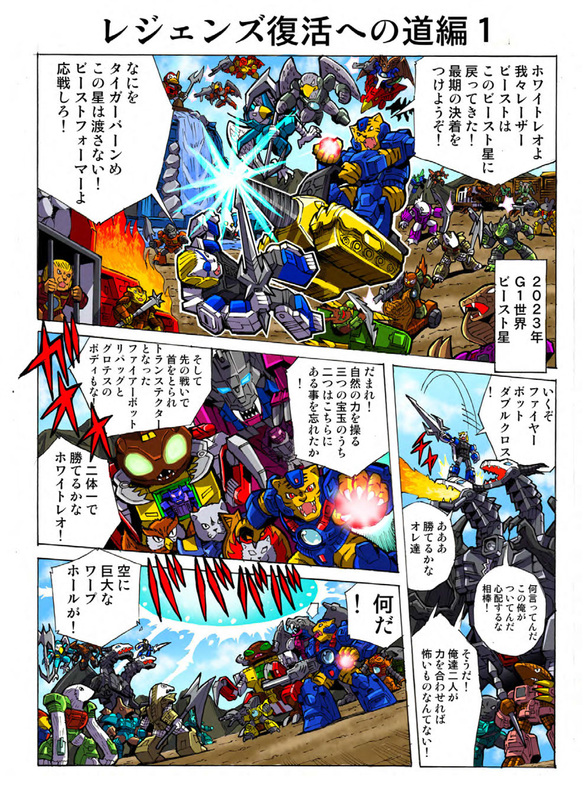 This web comic features several Beastformers, or Battle Beasts as they were known in the US. During the furious confrontation several Transformers join the battle including the Monsterbots Repug (Repugnus) and Grotes (Grotusque). As usual with these comics, we can spot several new characters for the story. Most noticeable is Toraizer, a blue robotic tiger which is a Headmaster. This figure was supposed to be part of Power Of The Primes Titan Master Wave 5, but it never got a release. You can download the pdf file here, or you can alternatively check out the mirrored images after the jump. Don’t forget to share your impressions on the 2005 Boards! 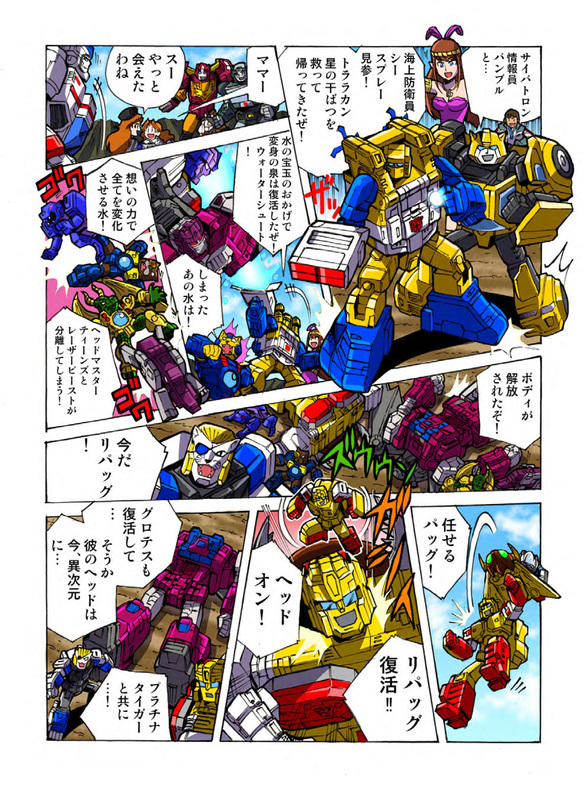 I hope Takara keeps putting these comics out in PDF format instead of each page being a jpeg. It's so much easier to save. How have the additional pages NOT been frontpaged by now??? Shifting to G2 bots and galvatron 2…. what do they have in stock now…? I would LOVE a Galvatron II repaint it the TR/Legends Galvatron figure. But then again, I want a Bludgeon based on the Legends comic as well as others that will probably never happen. I expect the story setup at the end there will continue into the Monsterbots pack-in comic. I'm afraid I haven't really been keeping up with the news on this set. Are pre-orders available anywhere? At the usual places (BBTS, TFSource, etc.). I wonder if the art suggests that Takaras will come with the Titans Return (Titan Masters Class) head. Sadly, we saw the Takara Legends release at Winter WonFes 2018. Straight re-release of the Hasbro Special Edition Titans Return figure. This is just playing around with the toys in a transitional sequence. Just search Tets' Toys and Shenanigans I think he has done the most. The Karyuudo Fansubs team did a hand full. 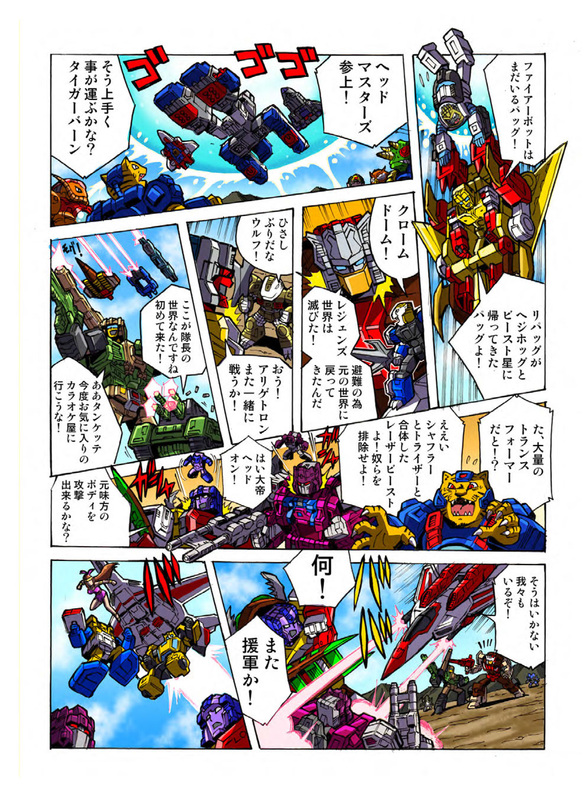 And two guys named Sanchimaru and Jalaguy did the Unite Warriors comics and the Trypticon on. Ah, gotcha. I think i have most of their stuff. Thanks anyways! Do you know of someone doing an actual all-out translation of Legends comics? If so, post a link!! Unfortunately, nobody has yet made it their task to translate all of them, until now. But the wiki has only a summary and not a literal translation of the comic.